The Falcons, who expect to be in the hunt for a title in their first year in the new-look Pacific Conference, were eager to test themselves against one of the state's powerhouse programs. They got off to a promising start, too, driving the ball inside the 10-yard line on the game's opening drive. In what was the theme of the night for the visitors, though, Liberty did not seize the opportunity, fumbling the ball away on first-and-goal. Two plays later, the Lakers quarterback Jackson Laurent connected with Thomas Dukart on a 5-yard hitch, which the junior wide receiver turned in to an 86-yard touchdown by beating his man to the edge and racing home from there. Lake Oswego added touchdowns on its next two drives to put the Falcons deep in the hole and rolled to a 45-13 victory. "It shows how important it is to never back down, never give up," Lakers coach Steve Coury said of the early momentum swing. "They made a couple of big runs, we missed some tackles and they got down there. Our kids kind of stiffened up, we got a break and we started taking advantage. After that, the defense settled in to really playing them well." After a pair of three-and-out drives for Liberty gave the home team a short field for its second and third touchdowns, both via passes to running back Casey Filkins, the Falcons missed a second scoring chance on a deep pass that was dropped. Liberty coach Eric Mahlum's squad did finally shake off that slow start, putting together a 17-play, 90-yard scoring drive that made it 21-6 with 7 minutes remaining in the second quarter. Quarterback Brad Norman, who caused the Laker defense problems with his running and passing, found junior Marquis Brown for a 14-yard touchdown pass to cap the drive. 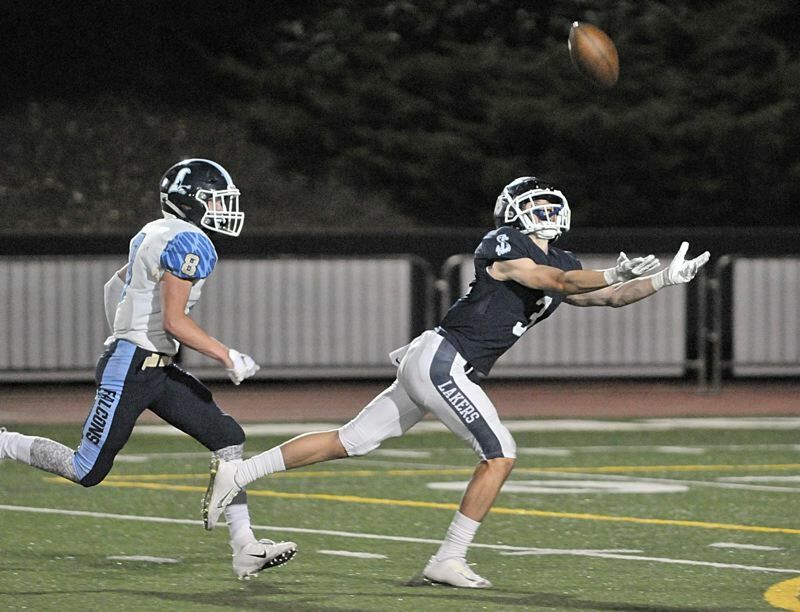 Liberty caught Lake Oswego off guard with an onside kick, but could not convert the ensuing possession into points despite moving the ball to the 6-yard line for first-and-goal. A pair of losses, including a sack by Chris Todd and Mike Mercep, pushed the Falcons back to the 19 and they came away empty after a pair of incomplete passes. "We had our opportunities to be in the game, but you can't leave those on the short porch and not close the deal," Mahlum said. "That's the difference between our two teams right now. They're a really good team that finishes. We're a good team trying to figure out how to finish." The Lakers stayed aggressive on their next series, driving 81 yards to go up 28-6 at the break after Laurent threw his fourth touchdown of the half, this time with senior Jack O'Brien laying out to catch a 32-yard pass in the end zone with 42.6 second left in the second quarter. "I think we had a great mindset," Laurent said. "I know a lot of guys after the game last week, into this week, were pretty disappointed and felt a little bit robbed. But I feel like we responded really well." Lake Oswego followed up by scoring on its first two drives of the second half, on short touchdown runs by Gabe Deville and Filkins, to go up 42-6 with 3:26 left in the third and put any thought of a Falcon comeback to rest. Filkins rushed the ball 10 times for 64 yards, caught four passes for 38 more and scored three touchdowns. Laurent completed passes to seven different receivers on the night, finishing 15 for 22 for 306 yards and four scores. "The stats probably show I played a pretty good game, but I was definitely not perfect and there's a lot of stuff I need to work on, especially my deep balls and mid-game," Laurent said. "With the guys that we have, I get the ball in their hands as quick as I can, let them do their thing and they'll get the yards." The Lake Oswego defense also had a strong outing, limiting the Falcons to 259 yards, but did struggle at times to deal with Norman, who completed 8 of 14 passes for 106 yards and two touchdowns, while also leading the team in rushing with 61 yards on 15 carries. "He's very elusive and he's a tough kid," Coury said. "He worried us all week. He can run the option and he scrambles and they run some plays with him. He's a really good player and they have a good receiver that they get the ball to. That's a good team." Norman's second touchdown pass was a 33-yard strike to Cole Smith that made it 42-13 at the end of the third and Lake Oswego played its substitutes for much of the final period, adding a 22-yard field goal by Diyar Dezay. The Falcons (3-2 overall) lost their starting center in the first quarter and had issues with the snap all evening, but Mahlum was pleased with how his team dealt with the adversity it faced throughout the contest. "We kept competing and we came back," Mahlum said. "We could have easily just folded up our tents, but we got that last score." After opening the season 3-0, Liberty has now lost two straight (against Oregon City and Lake Oswego) and will regroup to begin Pacific Conference play with a home game versus Glencoe at 7 p.m. Friday. "I think it's great for us to see the competition that's out there, getting a look at how we match up against these teams," Norman said. "Miscommunications or not, mistakes or not, we really want to compete with these teams. It gives us a great look for what we need to work on for league and playoffs." For his part, Coury was pleased with how his team took the loss to Clackamas in stride and put in a good week of practice to prepare for the Falcons. That's an encouraging sign considering the gauntlet the Lakers (4-1 overall) still face in the final four weeks, including a home game versus West Linn on tap next week. "They got over it quick," Coury said. "I think they felt that they had some chances and also knew and felt like they got beat by a good team. Life moved on. It's a great lesson for down the road because if you get to the playoffs and lose, you're out, whereas that one didn't cost us. I thought our kids bounced back really well all week long, then tonight they did what they needed to do."